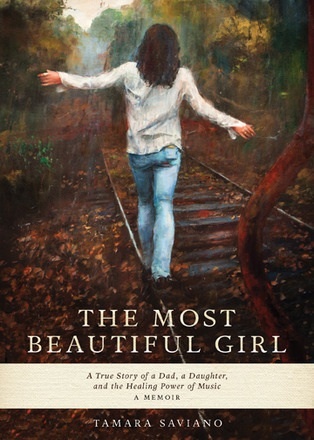 Tamara Saviano will release the memoir The Most Beautiful Girl: A True Story of a Dad, a Daughter and the Healing Power of Music, on Feb. 10, 2014 on American Roots Press. Saviano has carved an impressive music industry career over the past several years. She works with songwriters Kris Kristofferson and Guy Clark. She was honored for her production work on Beautiful Dreamer: The Songs of Stephen Foster, which earned a Grammy for Best Traditional Folk Album in 2005. The Most Beautiful Girl delves into the Wisconsin native’s childhood, chronicling the strained relationship between father and daughter, and the lasting power of music. Kristofferson penned the book’s foreward. The book begins at Johnny Cash’s funeral, where Saviano grieves the lost connection with her father. Saviano’s father, Robert Ruditys, died two years before Cash. Ruditys had not spoken to his only daughter for more than a decade before his death. She later finds comfort in her father’s favorite music. The chance paid off beautifully. Saviano launched a public relations company, signing Kris Kristofferson has a client. She later expanded into artist management, project management and consulting. Saviano also co-wrote the eBook From Art to Commerce: A Workbook for Independent Musicians. Saviano is also a former music journalist (Country Music Magazine) and television producer (Great American Country). She is currently writing a biography of Guy Clark.